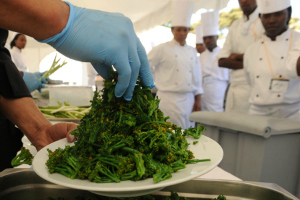 Chef Ray Cournede shows Kenyan-grown broccoli rejected by supermarkets. UNEP. On 1st April in Brussels, Feeding the 5,000 and a coalition of European partner organisations will feed 5000 people in Brussels with a free lunch made entirely from food that would have been wasted. Campaigner Tristram Stuart wonders whether Europeans are making the best use of wasted food in terms of recovering and recycling its value. Tristram Stuart is the founder of Feeding the 5,000 and author of Waste: Uncovering the Global Food Scandal. He is a BBC Food & Farming Awards Finalist 2014 (Feeding the 5000, The Gleaning Network, The Pig Idea), and a Sophie Prize winner, 2011. At the event in Brussels, tonnes of green beans and other produce from as far away as Kenya will be given away for free to demonstrate the injustice of wasting food on this scale and what Europeans can do to stop this. Some of the food on offer will have come from as far away as Africa. Farmers visited by the Feeding the 5000 team in Kenya are wasting 40% of the food they grow thanks to the unfair and unnecessary trading practices of European supermarkets whom they supply. One exporter outside Nairobi visited by the team, while working in partnership with UNEP, wastes at least 20 tonnes of edible produce every day. Worst of all, waste handlers collecting the unwanted produce are made to sign a contract guaranteeing that none of the “green waste” will be used to feed people, even though most of it is perfectly fit for consumption – and meanwhile millions go hungry on the other side of the depot’s perimeter. Typically the produce is wasted either because the European retailer has cancelled a forecast demand at the last minute, or because it has failed the ultra-fussy cosmetic standards of the retailers. Farmers incur the cost of this waste even though it has been caused by the policies of European supermarkets. A recently passed law in the UK, the Groceries Code Adjudicator Bill, ensures that UK supermarkets abusing their power in this way can be subject to public naming and shaming and ultimately fines of up to 1% of turnover (the equivalent of up to half a billion pounds). Measures to introduce similar regulation across Europe are under way and Feeding the 5000 will indicate that this would help to reduce waste by encouraging supermarkets to make more accurate forecasts, and avoid unfair trading practices. Within Europe, much needs to be done to optimise the conditions for donating unsold food for charitable purposes. The parliament of the Brussels region recently voted to force supermarkets to donate unsold food rather than destroy it: should other countries follow suit? Or should we follow France and the US in offering companies a tax rebate on the value of donated food? At the least all countries that still impose VAT on food that is donated, presenting a clear barrier to food redistribution, should surely follow Poland and Belgium’s example and scrap VAT on food donations. Identifying best practice fiscal and food hygiene frameworks to encourage companies to donate food to charities rather than dump it will be one topic of debate at the conference held in the wake of the Feeding the 5000 event. Meanwhile, when food waste does occur, are Europeans making the best use of it in terms of recovering and recycling its value? Forests are currently being destroyed to produce soy and other virgin crops that feed European livestock. Why don’t we use food waste that can’t be used for humans to feed our livestock instead? We should encourage the European initiatives underway to review the unnecessarily strict ban on feeding food waste containing animal by-products to pigs and chickens.